LEVEL 5 Supplemental Exams Download has been added successfully to your wishlist. 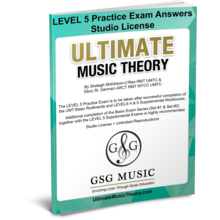 LEVEL 5 Supplemental Exams - The UMT Supplemental Exams are specifically designed to prepare students for successful completion of Nationally Recognized Music Theory Examinations including the Royal Conservatory of Music Theory Exams. 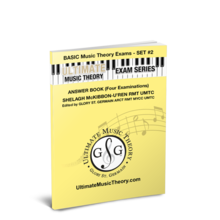 (For maximum learning, complete the Basic Rudiments and LEVELS 4 & 5 Supplemental Workbooks followed by the Basic Rudiments Exams Set #1 & Set #2 together with the Supplemental Exams LEVEL 5. Studio License - Unlimited Downloads! 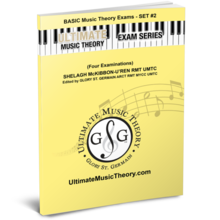 BONUS - Supplemental Exams include TOP 10 Ultimate Music Theory Tips To Score 100% on Exams! Join the 100% CLUB - Upon receiving 100% on a nationally recognized theory exam, submit your contact info to the UMT 100% Club to receive your Certificate of Achievement - Congratulations! NOTE: All UMT Exams have matching downloadable Exam Answers available for each level. Basic Exam Set #2 Answers Download has been added successfully to your wishlist. Basic Exam Set #2 Download has been added successfully to your wishlist. LEVEL 5 Practice Exam Answers Download has been added successfully to your wishlist. 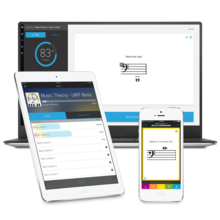 Ultimate Music Theory App has been added successfully to your wishlist.